Austin Film Festival furthers the art and craft of storytelling by inspiring and championing the work of writers, filmmakers, and all artists who use written and visual language to tell a story. In addition to an 8 day film festival and 4 day Conference, we offer Year Round Events, a Young Filmmakers Program, a TV show, Radio show, Podcast and more! Get to know the faces and stories of the people who run the show for the Austin Film Festival! Want to work with us? We're always looking for folks to join our team whether it's through volunteering or interning or working with us on staff. Check out our current opportunities below. Check out our job opportunities! Check out our frequently asked questions! Austin Film Festival welcomes new ideas and would love to work with any organization that shares interest in the arts and entertainment industry. Exclusive screenings, script readings, Conversations in Film, parties and more! Not only is your donation tax deductible, but your support helps us to further the art and craft of filmmaking in our state. We're always looking for interns to join our team and be an integral part of pulling off our incredible programs! Volunteers are a huge part of what we do at AFF. Plus, we have a ton of fun! Austin Film Festival would like to acknowledge and thank our many Festival Sponsors who demonstrate their commitment to aspiring filmmakers and screenwriters through their financial support. Their contributions not only enhance our annual event but ensure Austin Film Festival can continue to administer its various educational initiatives throughout the year. See what others are saying about Austin Film Festival. Austin Film Festival strives to be accessible to all patrons of the arts. Read about our accessibility and sign-language interpretation. Subscribe to our newsletter to stay in touch! Feel free to contact us with any press inquiries. The weekly, 30-minute television series features interviews with filmmaking greats paired with short films. Praised as recommended reading by film and media studies professors and filmmakers alike, the book offers introspections and recollections on the creative process. The one-hour radio program & our podcast both feature the creative minds behind True Detective, The Graduate & more. Join us in Oct for over 180 films, Q&As, indie breakouts, narrative and documentary competition features, classic retrospectives, and a stellar shorts program. Purchase your Film Pass while you still can! This pass will get you into any of our venues across Austin! It is perfect for first time attendees who want a taste of the excitement at AFF and the opportunities to see this year’s award-season contenders alongside little indie gems and everything in between. Get on the FP notification list so you don't miss any updates! The keen eye for the importance of story in film is apparent in every selection by the programming team​, and the camaraderie they foster among filmmakers results in a friendly and fun festival that I am happy to call home." This competition accepts both filmed and written submissions in an effort to find talented voices who can adapt their vision to emerging digital platforms. AFF will select one winner who displays the strongest voice and greatest potential for establishing a digital series. The competition is free to enter and open to youth filmmakers ages 12 to 18! The competition opens DECEMBER 6th! Check out our workshops that help kids and young adults create their very own fabulous short films! Our program works with schools to improve communication skills through film. Austin Film Festival’s Young Filmmakers Scholarship Program grants access to over 300 scholarships for students and teachers in middle and high school. Did you know that Austin Film Festival provides group discounts to students at colleges, universities, and specialty schools? Consistently considered by MovieMaker Magazine as one of the “50 Film Festivals Worth the Entry Fee,” AFF allows participating writers and filmmakers to measure themselves against the very best, while also providing valuable networking and learning opportunities. Check out our year-round opportunities to attend conversations with industry pros, advance screenings, special retrospectives, filmmaker Q&As, parties and more! Throughout the year we screen selections from our Audience award winning films from the previous year's festival. Whether it's a networking event, workshop, conversation in film, or screening we've always got something coming up! 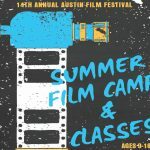 The critically-acclaimed and uber-loved Summer Film Camps & Classes, presented by Austin Film Festival, returns this June with rocking workshops that promise to teach, inspire, and help kids and young adults create their very own fabulous, funny, thought-provoking, heartbreaking, award-winning (you never know!) short films. The opportunity to work with an instructor who has real world experience in the film industry during summer camp made a real impact on my [teen]. 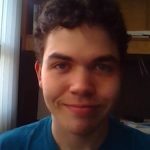 He loved everything about his camp experience!" We offer a variety of parties beyond film screenings with opportunities for networking or just having fun. We’re party people! Amazing food! Amazing drinks! Amazing night! Our Film & Food fundraising gala benefits our Young Filmmakers Program. Each year at the Festival, we celebrate the year’s honorees and competition winners at the Awards Luncheon. Join AFF today for a year’s worth of advanced screenings, film premieres, script readings, Conversations in Film, exclusive parties, and more! You’ll also receive discounts around town at participating businesses such as Alamo Drafthouse Village and Stephen F. Austin Bar and Terrace. Not to mention discounts to our Film & Food Fundraiser (otherwise known as the best party in Austin). Membership starts for as little as $35! 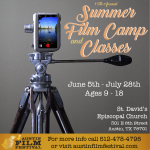 Austin Film Festival’s 15th Annual Summer Film Camp returns this June at St. David’s Episcopal Church for its 15th Annual program for aspiring screenwriters, filmmakers, and Claymation enthusiasts ages 9-18! Our Summer Film Camp is all about storytelling. In this immersive and creative environment, we encourage campers to find and tell their own stories. Then we teach them how to turn those stories into their very own movies with the help of a supportive crew of peers. Plus, campers get to participate in panel discussions with inspiring guest speakers that are major Hollywood writers, producers, and directors! And finally, to finish off with a bang, all finished films will premiere at the Summer Film Camp Showcase at Galaxy Highland on Sunday, August 6th. Camp is held right downtown at St. Davids Episcopal Church – 301 E. 8th St, Austin, TX, 78701. One and two week sessions offered from June 5th to July 28th. Morning, afternoon, and full-day classes available for age groups 9-12. Afternoon and full-day classes available for age groups 13-18. Year-round opportunities to attend conversations with industry pros, advance screenings, special retrospectives, filmmaker Q&As, and parties. An evening dedicated to celebrating Austin’s thriving film industry and famous culinary talent! Held in the glamorous and historic Driskill Hotel, the event brings Austinites and visitors together to celebrate the film arts and enjoy flowing cocktails and inventive cuisine from some of Austin’s most notable chefs. Live and silent auctions showcase the very best in luxury items, trips, and experiences. Exclusive advanced screenings, film premieres, script readings, Conversations in Film, party invitations, and more! Skip the long lines and enjoy first entry into the theatre as an AFF Member . You’ll also receive discounts around town at participating businesses. Austin Film Festival welcomes new ideas and would love to work with any organization that shares interest in the arts and entertainment industry! Austin Film Festival is a 501-3 organization. Your donation is tax-deductible to the extent allowed by the law. AFF has also made great strides promoting film production in Texas. Your support helps us to further the art and craft of filmmaking in our state. Attend our Awards Luncheon, Pitch in our Pitch Competition & party at our Film & Food Fundraising Gala! Shirts! Posters! Books & more! Shop our incredible merchandise now! AFF offers a badge and pass options for everyone! Look through our different options, and find which badge is the perfect fit for you! What Badge is Right For Me? Students, members and entrants in our competitions all receive discounts on badges! Learn more. Austin Film Festival showcases an outstanding program of narrative, animation and documentary features and shorts, including premieres, advanced screenings, and independent films. Purchase a Film Pass for access to eight days of film screenings during Austin Film Festival – including over 180 films and Q&As, indie breakouts, narrative and documentary competition features, classic retrospectives, and a stellar shorts program. Want to be first in line? Purchase a Lone Star Badge and get priority access for all film screenings! Plus, get access to a full day of incredible panels at our Screenwriters Conference! Our Conference is a one-of-a-kind event. Take a look at what we've got lined up for you! We're pleased to bring the industry's best to Austin for you! Check out our incredible line up of films from last year's festival. Check out our panels from the 2016 Conference. Check out our confirmed panelists and award recipients! Check out a sampling of our panel topics! Austin Film Festival offers all badge holders discounted rates at our hotel partners. Hotel space is limited and allotted on a first come, first serve basis. Contact us for availability at 512-478-4795 or the toll free number 1-800-310-FEST (3378). Check out all our award categories! From jury awards to audience awards, AFF hands out over 40 awards each year! View the past 20+ years of winners! Awardees, Film Competition, Screenplay Competition, and Audience Award winners! Read what others are saying about Austin Film Festival. 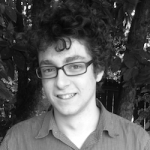 AFF’s Coverage Program provides a detailed, constructive evaluation of your script and at $100 for feature scripts and $80 for teleplays, it’s the best bang for your buck! All of AFF’s readers are required to provide detailed, constructive notes for each script they review. We will provide reader comments to ALL entrants. For FREE! I’ve gotten meetings with production companies with first look deals at networks that I never would have gotten on my own." Our film competition recognizes the importance of narrative at the core of filmmaking. The Jury Award winners of our Narrative, Documentary and Animated Short categories officially qualify for an Academy Award®. Moviemaker Magazine named AFF as one of the “50 Film Festivals Worth the Entry Fee” in 2015, 2016 & 2017 and a “Top 25 Coolest Film Festivals in the World” in 2014. Submit 1-3 filmed episodes, totaling no more than 30 minutes in length. Submit 1-3 scripted episodes, totaling no more than 30 pages in length. As Austin Film Festival continues to grow and expand, our vision also widens with the addition of new avenues for storytellers. The Playwriting Competition is open to full-length stage plays and gives playwrights a chance to explore our film and television conference. It will also allow film professionals to discover storytellers who have mastered the art and craft of stage drama. The Fiction Podcast Script Competition, leverages our legacy of championing storytelling to launch writers into the emerging world of podcasts. This competition connects audiences with incredible new stories, as well as connects writers with a medium that offers an incredible access to audiences and limitless opportunities to launch new stories. AFF’s Young Filmmakers Program introduces the arts of screenwriting and filmmaking to young people, ages 9-18, and provides them with venues for developing their storytelling talents. The program offers kids opportunities to share their creative work with peers, the public, and professional filmmakers and screenwriters. By introducing young people to the film industry, the program hopes to provide them new mediums to express their creativity, improve their communication skills, and benefit the entire arts community. This exhilarating and unique event allows contestants 90 seconds to pitch their best ideas to a panel of judges made up of agents, producers, managers and screenwriters in a constructive and friendly environment. MAKE SURE TO GET YOUR TICKET NOW AS THIS EVENT SELLS OUT EVERY YEAR. Who knows what might happen? At the 2010 Pitch Competition, Mike Fry (Over the Hedge) optioned Lee Hoverd’s screenplay Ex-Men after hearing his pitch as a judge for the competition! We have events all year-round! Whether it's an advance screening, a conversations with a filmmaker, or a screening from one of our series of film programs, we are thrilled to offer incredible year-round programming! Film & Food Fundraising PartyNow in its 15th year, Austin Film Festival’s annual Film & Food Fundraising Party is one of the most highly anticipated events in Austin! The glamorous and historic Driskill Hotel hosts this fantastic evening of flowing cocktails and inventive culinary treats, presented by 20 of Austin’s hottest restaurants. A Conversation with Felicia D. HendersonJoin Austin Film Festival on Sunday, May 5 at the Harry Ransom Center for a conversation with writers room veteran Felicia D. Henderson. Read our Press Releases and find out what we're up to! Have you filled out our Camp Survey yet? We'd love to get your feedback. Click HERE and help us make Summer Film Camp the best it can be! This even has now passed. Have you filled out our Camp Survey yet? We'd love to get your feedback. Click HERE and help us make Summer Film Camp the best it can be! ©2019 Austin Film Festival • Austin Film Festival is a Not for Profit 501(c)(3) Corporation.